Puzzle is our 4 year old Blue Merle Australian Shepherd we adopted from Woodlands Aussies here in Wisconsin. 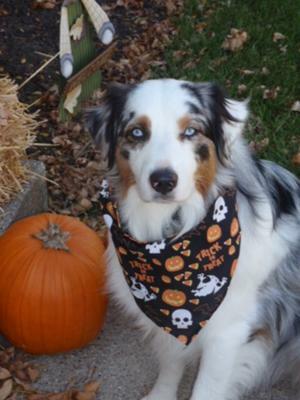 We went to visit her with the intention of getting a puppy, however upon entering her home my husband and I were met at the door with several beautiful Aussies, one of which was Puzzle. He looked at me with those beautiful blue eyes and I was hooked. Realizing that a puppy might be a bit too much for us to handle at that time, I asked the breeder if she would allow us to adopt Puzzle and the rest is history. Since adopting him I put him through the Canine Good Citizens test followed by the Therapy Dog program and he has flourished doing this job. He works daily at our local hospital, nursing homes, retirement homes, and soon our local library doing the Tail Waggin Tutor program, where children read to the dog as their form of therapy. He just loves his job, so much that when I ask him if he is ready to go to work, he jumps up and runs to the door. We love and adore him and hope more Aussies do this kind of work because they are so greatly needed. My dog, MacTavish (Mac) has been going to the nursing homes now for several years. He knows that he has to "go to work", even though he is a very hyper dog. I love this boy (7 years old) like my own child, and all who meet him do as well. Congrats to you and Puzzle! Therapy work is near and dear to my heart. We have been involved with TDI for about 14 years and we still love it! I have had 6 of my dogs work in therapy and I have a 1 1/2 year old going for her certification in December.